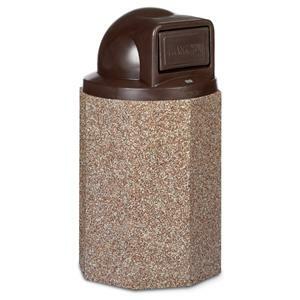 This Structure Collection 55 Gallon Stone Octagonal Trash Receptacle with Dome Push-Door Top is constructed of incredibly durable natural stone cast in polymer matrix concrete that lasts for years. The Dome Push-Door Top shields contents from elements & from view. 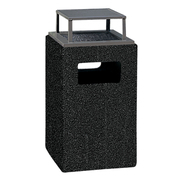 Made with natural stone cast in polymer matrix concrete, these heavy-duty receptacles are exceptionally strong, but weigh less than concrete alternatives, saving you money on freight. A plastic rigid liner is included to make maintenance easy with the lift-off lid that facilitates full access to contents. 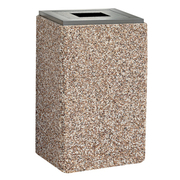 This Structure Collection 55 Gallon Stone Recycling Receptacle provides rugged performance with cast stone and epoxy construction making them ultra-strong with the appealing upscale look of aggregate stone. 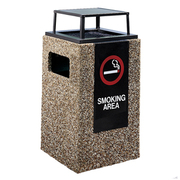 The Recycle Top is made of zinc primed Bronze powder coated steel and includes a Bottle/Cans decal for the smaller opening; Paper decal for the larger opening. 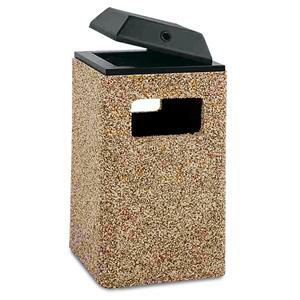 Also includes two 20 gallon rigid, reusable plastic liners. Just as durable as concrete receptacles, they weigh less which will save on freight costs. Optional hold down kit is also available. This Structure Collection 48 Gallon Stone trash Receptacle with Ashtray Bonnet Top provides rugged performance with cast stone and epoxy construction making them super-strong, plus the appealing upscale look of aggregate stone. Features an Ashtray Bonnet Top that allows full access to the receptacle while allowing easy smoking disposal. 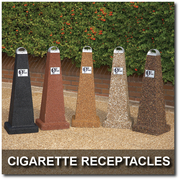 A generous supply of Black Beauty sand substitute is included with the ashtray. Optional hold down kit is also available. Rigid plastic liner is included making maintenance easy with the lift-off lid allowing full access to contents. This Structure Collection 48 Gallon Stone Trash Receptacle with Curved Bonnet Top is perfect for high-traffic areas. The Curved Top keeps contents shielded from view & the elements. 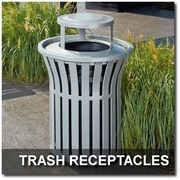 It also prevents items from being place on top of the receptacle. Available in your choose of 6 stone colors & 2 lid finishes. 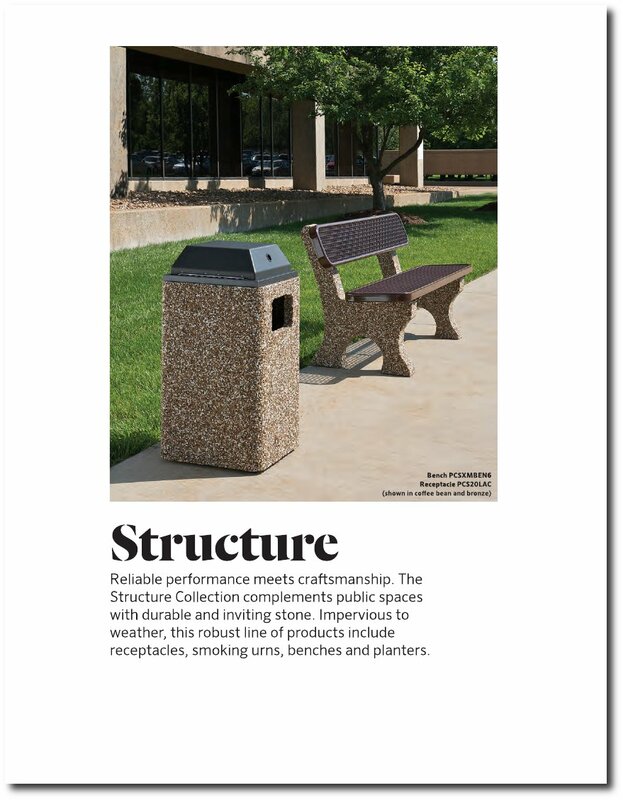 Stone units are comparable to reinforced concrete but weigh considerably less. 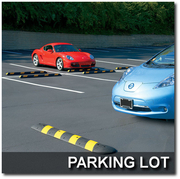 This saves on freight when compared to similar concrete items. 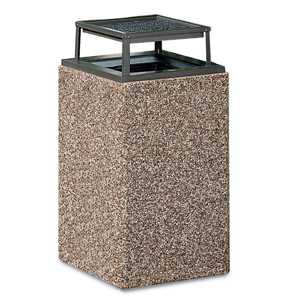 This Structure Collection 48 Gallon Stone Trash Receptacle with Flat Open Top is perfect for high-traffic areas. 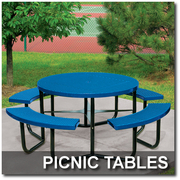 The Flat Open Top is easy removed for full access to the rigid plastic liner inside. 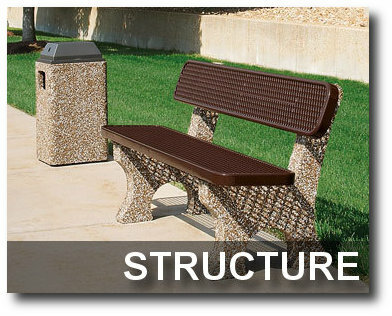 Stone units are comparable to reinforced concrete but weigh considerably less. This saves on freight when compared to similar concrete items. Choose from (5) distinctive natural stone colors. This Structure Collection 32 Gallon Stone Trash Receptacle with Flat Ashtray Sand Urn Top combines ash and trash disposal in one beautiful receptacle. The side openings are 12" x 6" and reinforced with rebar for added strength. 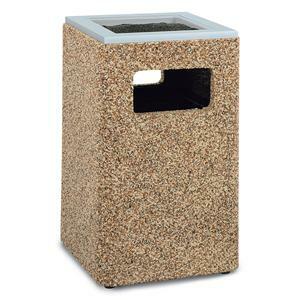 The Ashtray Sand Urn Top is our largest at 14" square. Stone units are comparable to reinforced concrete but weigh considerably less. This saves on freight when compared to similar concrete items. Rigid plastic liner is included makes maintenance easy with the lift-off lid that allows full access to contents. This Structure Collection 32 Gallon Stone Trash Receptacle with Ashtray Bonnet Top is not only a great option for litter and ash disposal, it's weight is a natural theft-deterrent. The tough exterior and heavy weight helps ensure it stays where you place it. 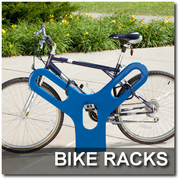 Constructed with a minimum wall thickness of 1/2". The side openings are 12" x 6" and reinforced with rebar for added strength. The Ashtray Bonnet Top is our largest at 14" square. 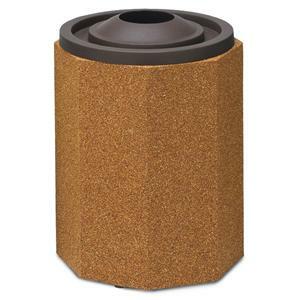 Includes a rigid, reusable plastic liner and has protective rubber feet that won't gouge floors. 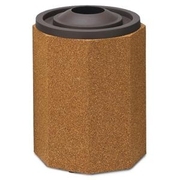 Ashtray also includes a generous supply of Black Beauty sand substitute. 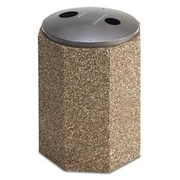 This Structure Collection 32 Gallon Stone Trash Receptacle with Ash Cover Top is not only a great option for litter and ash disposal, it's weight is a natural theft-deterrent. The tough exterior and heavy weight helps ensure it stays where you place it. 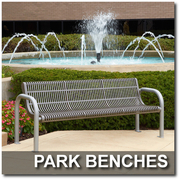 Constructed with a minimum wall thickness of 1/2". 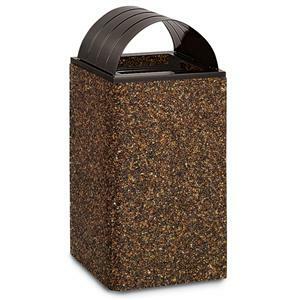 Includes a rigid, reusable plastic liner and has protective rubber feet that won't gouge floors. 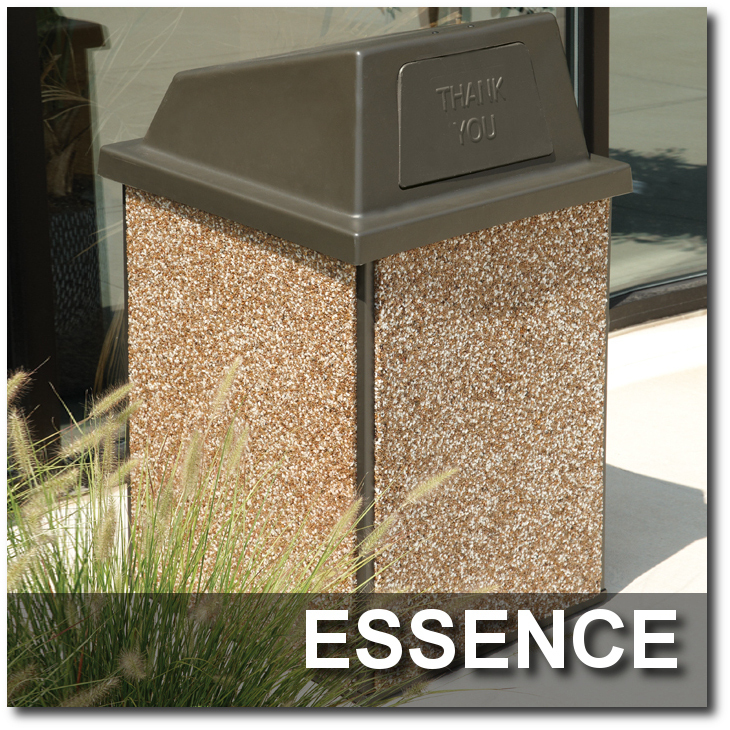 Ash Covers are constructed of 3/16" Bronze polyethylene and have a stainless steel hinge that opens for easy maintenance. Includes a generous supply of Black Beauty sand substitute.